Apparently, last night Matt got ambitious and thought he was going to feed the entire town of Springville. I was at work and I think he was bored. 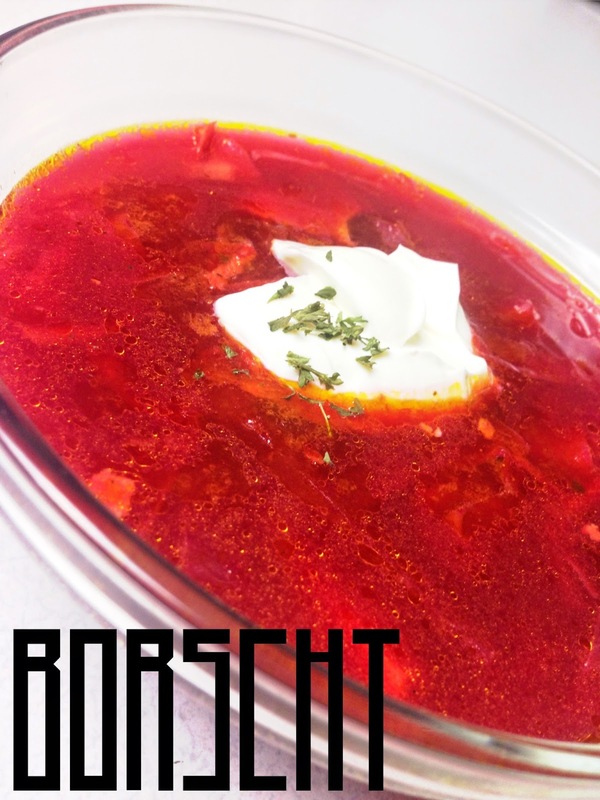 He made so much Borsht, an Ukrainian soup, that we have left overs for months. However, I am a picky eater and I think it’s pretty great! Matthew served his mission in Russia and loves to make me try all of these random things. When we were celebrating our anniversary we had to stop at the Russian market to buy a bunch of items. He made me try Kvas which is like root beer but it’s made with rye bread. I think it requires an acquired taste. Here is Matt’s delicious Chicken Borscht! 1. This recipe makes 8 quarts, so use a large enough stock pot.Bring to boil 1 gallon of water, add bouillon cubes. 2. While the water boils, sear the cubed chicken and 3 minced garlic cloves in a skillet with some oil. Remove the seared chicken and sauté the diced onions, shredded carrots and the rest of the garlic until golden with the rest of the oil, leave over medium heat, add half of the julienned beets to sautéed mixture, stir occasionally. 3. Add chicken, cubed potatoes and the rest of the julienned beets to boiling water, leave on medium heat. 4. Add skinless diced tomatos to the sautéed mixture and stir well, leave over medium to low heat add pepper, parsley, and dill to the mixture. 5. Squeeze lemon juice into bowl and remove seeds, then pour into to the stock pot. 6. Slice cabbage into thin slices and cut them into bit size pieces and add to the stock pot. 7. Add sautéed mixture to the stock pot and bring to boil for 10 mins, stir occasionally, add salt and pepper to taste. 8. Turn off heat, add the whole bay leaves, stir and leave soup to rest for 1-1.5 hours covered. 9. Add a dollop of sour cream or mayonnaise, stir to incorporate the dollop or just spoon a little of each bite, or eat it without. I prefer sour cream, you can eat it hot or cold. I think it’s better hot! wonderful combination of flavors. Hugs! Thanks for sharing this with us over at Pin-Worthy Wednesday, looks delish! Pinned!